Okay, I cannot even with this book. It's been recommended to me so much and it's been all over the internet recently. I have to say there's a good reason for that. 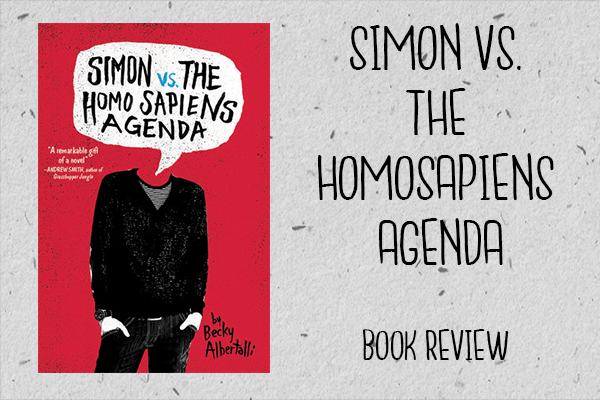 The main character Simon is just incredible and I love him. I really liked how he felt like a real teenager, he didn't have unrealistic thoughts like so many characters in YA books do and I really loved his inner monologue. The love interest 'Blue' was also absolutely adorable. Reading the emails between Blue and Simon literally made my heart want to burst with excitement because I shipped these two SO much! I really felt like I saw their relationship grow as the book went on and it was beautiful. I think the thing I enjoyed most about their relationship was that neither knew what the other one looked like. It was so precious because they just loved each other for their personalities and I feel like that is so rare in books, in life even! So throughout most of the book you don't know who Blue is, there's a number of people who you're like 'maybe'... but you do find out later. I have to say I did guess who it was which was kind of disappointing because I really wanted to be surprised, but I'm not to bothered by it. I don't feel like it took away from the plot at all and I still really enjoyed the book. The only other issue I had with this book was that I didn't feel overly impacted. I think it might have something to do with the hype around it. I don't know, I was expecting revolutionary and I just didn't get quite that. Don't get me wrong I still gave this book 4.5/5 stars because I loved it and it's definitely on of my top reads of the year so far but I was expecting slightly more. Have you read this book? Or do you want to? What did you think of it? Let me know in the comments! I'm so happy to hear that you loved this! I loved getting to see Simon and Blue fall for each other. I hope you love The Upside too! It's fantastic. Great review! Yes me too, they were just the cutest! I just finished the upside, all good things once again!! I'm so glad you enjoy it! I read it more than a year ago, and was SO in love with the book, even though, I didn't even want to pick it up, because neither the cover, not the title grabbed my attention. I was a fool, obviously, because it IS FANTASTIC. I loved all the cuteness AND Simon's sarcasm and how he sounded like an actual teen. I can't wait to finally get my hands on Albertalli's new book. Great review! No I thought the exact same thing! When I first heard people talking about it I wasn't interested at all because, like you said, the cover didn't attract me and the title didn't seem very catchy. Now though, I couldn't imagine it being anything else. I just read her new books and it was amazing! Sometimes when I see a book hyped so much I start to loose interest or hope for a book. Does that make sense? I've had some bad luck with over hyped books in the past but I probably shouldn't judge every book that way. I see this book so so often but have never given it a read myself, I enjoyed your review though and it's made me consider giving it a go. I'm exactly the same, so many times I've read a really hyped up book and just ended up feeling mediocre about it. Which is why I had a few reservations about this one, but it turned out to be fantastic! I also just finished reading Becky Albertalli's new book and that is incredible as well! I loved this one too :) Hype can totally have an impact on what you think though so I get that. Great review!! Yeah, I was really worried that the hype was going to ruin the book for me but it turned out not to be a major issue at all! I do wish it was a little less hyped though because I think I would have loved it even more if I hadn't had super high expectations going into it. Thanks for bringing this to my attention again! I've heard good stories about the book too. Have never put it on my TBR, but I will now! No problem! It's really cute! Be sure to let me know what you think if you ever get around to it! I would definitely recommend it! It's just so cute and amazing. Plus Becky Albertalli's new book is even more incredible! I think I'm in love with her! Let me know what you think of it if you get around to it! Yea, hype does affect how I feel about a book but I'm so glad it still was amazing despite the hype. Yep, I have been curious about this one and I do think I need to see if my library has it. Brilly review! I hope your library does have it! It was just a really lovely read, I didn't want it to finish! Yes! I just finished her new book and my review will be going up soon but I LOVED that one as well! It's a great contemporary, just beyond cute! I was like that for the longest time as well but I'm so glad I finally picked it up, Becky Albertalli is such an incredible author! I hope you enjoy it! So many people love it! It's so amazing! Her new book is incredible as well! I have so much love for Simon! Something about that book just does it for me. I've read it 3X since last year... and I am *not* one who ever re-reads. I adored Simon. His humor, his personality, his thought process. I swear, I just want to put him in my pocket and keep him. LOL I read The Upside of Unrequited last month and loved it almost as much. I'm now convinced that Albertalli can do no wrong. Great review, Kirsty! Wow that is a lot of re-reads! I've read the upside of unrequited as well and loved it even more than Simon. I'm with you though! Becky Albertalli is a new favourite author of mine, to write two amazing books is ridiculously impressive! I swear I will read this book before summer! lol I've been meaning to for forever and it must be done! Ah you really should! It did not disappoint! Becky Albertalli's new book is also amazing! !